Freddie Mercury (September 5, 1946 – November 24, 1991) was a rock musician, best known as the frontman and lead singer for the English rock band Queen. He is remembered for his powerful vocal abilities and charisma as a live performer. As a songwriter, he composed many international hits, including Killer Queen, Bohemian Rhapsody, Somebody To Love, We Are The Champions, Bicycle Race, Don't Stop Me Now, and Crazy Little Thing Called Love. Mercury died from complications of AIDS, greatly increasing public awareness of the disease. Freddie Mercury was born Farrokh Bulsara in Stone Town on the African island of Unguja (the largest island of the Zanzibar archipelago - at the time a British colony, now part of Tanzania). His parents, Bomi and Jer Bulsara, were Indian Parsis, descendents of 10th century Persian Zoroastrians immigrants in India. The family had emigrated to Zanzibar in order for Bomi to continue his job as a middle-ranking cashier at the British Colonial Office. Mercury had one younger sister, Kashmira. Mercury was sent back to India to attend St. Peter's boarding school near Bombay (now Mumbai). It was at St. Peter's where he learned to play the piano and joined his first band, The Hectics. He stayed in India for most of his childhood, living with his grandmother and aunt. Mercury completed his education in India at St. Mary's High School in Mazagon before returning to Zanzibar. He was 17 when he and his family finally fled to England, as a result of the 1964 Zanzibar Revolution. In England, he earned a Diploma in Art and Graphic Design at Ealing Art College, following in the footsteps of Pete Townshend. He later used these skills in order to design the Queen crest. Widely considered as one of the greatest vocalists in popular music, Freddie Mercury possessed a very distinctive voice. Although his speaking voice naturally fell in the baritone range, his singing voice was that of a tenor. His recorded vocal range spanned nearly four octaves (falsetto included), with his lowest recorded note being the F below the bass clef and his highest recorded note being the D that lies nearly four octaves above. In addition to vocal range, Mercury often delivered technically difficult songs in a powerful manner. However, due in part to the fact that he suffered from vocal nodules (for which he declined surgery), he would often lower the highest notes during many concerts. Mercury also claimed that he never had any formal vocal training. As a songwriter, Mercury wrote ten out of the seventeen songs on Queen's Greatest Hits album, including Seven Seas Of Rhye, Killer Queen, Bohemian Rhapsody, Somebody To Love, Good Old-Fashioned Lover Boy, We Are The Champions, Bicycle Race, Don't Stop Me Now, Crazy Little Thing Called Love, and Play The Game. However, by the 1980s, all four members of the band were writing hits. The most notable aspect of his songwriting involved the wide range of different genres that he used, which included, among other styles, rockabilly, heavy metal and disco. Compared to many rock songwriters, many of Freddie Mercury's songs were musically complex. As an example, "Bohemian Rhapsody" is acyclic in structure and comprises nearly sixty chords. On the other hand, "Crazy Little Thing Called Love" is made up of only a few chords. Despite the fact that Mercury often wrote very intricate harmonies, he claimed that he could barely read music. Although all four members of the band Queen were songwriters, producer Gary Langan, who worked in the studio with Queen on many of their early albums, notes that "Freddie was always intensely supportive of other people's songwriting and would give as much attention to one of the other's as he would to his own. It was so unlike other bands I've worked with where there is an acknowledged songwriter and anyone else who writes one really has to hassle to get it anywhere." Mercury wrote most of his songs on the piano, often choosing keys that were technically difficult for band mate and guitarist Brian May (e.g. E flat major). Although he possessed only rudimentary skills on the guitar, Mercury wrote many lines and riffs for the instrument, including many of those heard in "Bohemian Rhapsody." He also wrote "Crazy Little Thing Called Love" on the guitar. In addition to his work with Queen, Mercury produced two solo albums, Mr. Bad Guy and Barcelona, released in 1985 and 1988, respectively. The former was a pop-oriented album that emphasized disco and dance music. "Barcelona" was recorded with the opera singer Montserrat Caballé, whom Mercury had long admired. Although it remained on the UK Album Charts for 23 weeks, "Mr. Bad Guy" was not considered to have been a commercial success relative to most Queen albums. However, in 1993, a remix of "Living On My Own", a single from the album, reached the #1 position on the UK Singles Charts. The song remained on the charts for thirteen weeks and garnered Mercury a posthumous Ivor Novello Award. All Music critic David Prato descibes "Mr. Bad Guy" as "outstanding from start to finish" and expressed his view that Mercury "did a commendable job of stretching into uncharted territory." In particular, the album was heavily synthesizer-driven in a way that was uncharacteristic of previous Queen albums. “Barcelona”, recorded with opera singer Montserrat Caballé, combined elements of popular music and opera. Caballé considered the album to have been one of the great successes of her career and said of Mercury, “He was not only a popular singer, he was a musician, that could sit at the piano and compose. He discovered a new way to bring different music styles together. He is the first and only person to have done this.” In September of 2006, a compilation album featuring Mercury’s solo work was released in the UK in honour of what would have been his sixtieth birthday. The album debuted in the top 10 of the UK Album Charts. Over the years, rare Freddie Mercury solo albums have greatly increased in value. For instance, a Japanese single of the song “Guide Me Home” from the Barcelona album is now worth as much as £1,000 ($1,800).Another valuable item is a 1973 cover of the 1969 Beach Boys song, I Can Hear Music recorded under the stage name Larry Lurex. Widely bootlegged, the original record is now a valuable collectible. Mercury collaborated with Michael Jackson on some tracks which were never officially released, including “There Must Be More To Life Than This” and “State of Shock”, which were both leaked to the internet. Mercury also recorded another track with Michael Jackson called "Victory" that has yet to be released to the public. The latter song, released on the 1984 Victory album, was ultimately performed by Mick Jagger and The Jacksons. Mercury was originally scheduled to appear on the Thriller album as well. Although he had a very close girlfriend named Mary Austin for many years, Freddie Mercury had always been fairly open about his homosexuality. In a March 12, 1974 interview for New Musical Express, he told the interviewer: 'I am as gay as a daffodil, my dear!' Beginning in the mid 1970s, Mercury began a series of affairs with men, which ultimately resulted in the end of his relationship with Austin. However, the two remained close friends through the years, and Mercury often referred to Austin as his only true friend. In a 1985 interview, Mercury said of Austin, "All my lovers asked me why they couldn't replace Mary (Austin), but it's simply impossible. The only friend I've got is Mary, and I don't want anybody else. To me, she was my common-law wife. To me, it was a marriage. We believe in each other, that's enough for me. I couldn't fall in love with a man the same way as I have with Mary." In 1983, Mercury found a new lover named Jim Hutton. Hutton lived with Mercury for the last six years of his life, cared for him when he was ill, and was at his bedside when he died. 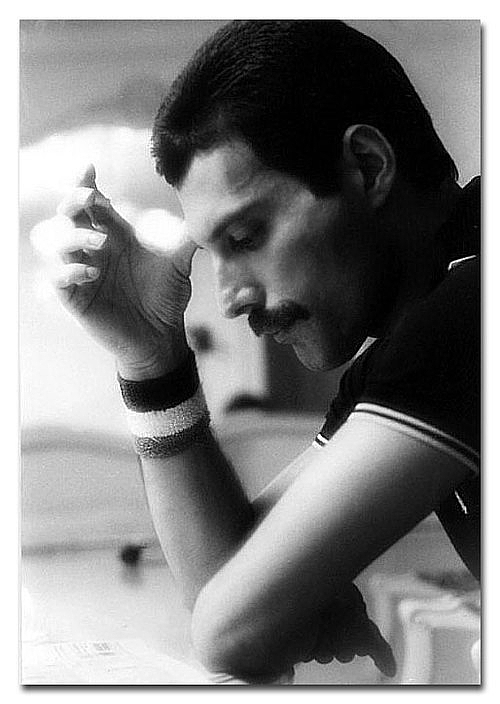 According to Hutton, Mercury referred to him as his husband, and died wearing a wedding band that Hutton had given him. Mercury possessed a notable overbite of his teeth that he had wanted to fix for many years. Early in his career, he commented that he wished to have work done, but regretted that he did not have time to do it. He also expressed fears that such an operation might damage his voice. While smiling Mercury would often cover his mouth with his hand, in an attempt to hide the overbite. According to the January 2004 edition of Cat Fancy, Mercury possessed a great fondness for cats, at one point owning as many as ten. Mercury's personal assistant, Peter Freestone, wrote that his boss "put as much importance on them [his cats] as any human life." The album Mr. Bad Guy and the song Delilah were dedicated to cats, and Mercury wore clothes featuring cats in videos and on album covers. Mercury kept his Indian descent a secret from most of his fans, rarely mentioning his heritage in interviews. He would sometimes refer to himself as "Persian," perhaps alluding to his identity as a Parsi. Many friends expressed their view that Mercury felt ashamed of his ethnic origins and feared racial backlash in a country that had long been troubled by race riots and violence against Indian immigrants. On the other hand, fellow band mate Roger Taylor suggested that Mercury downplayed his heritage simply because he did not feel that it would fit well with his rock musician persona. According to Mercury's partner, Jim Hutton, Mercury was diagnosed with HIV in the spring of 1987. Mercury claimed to have tested negative in an interview published that year, and continued to deny that he had HIV. Despite these denials, the British press continued to pursue the rampant rumours about Mercury's health. The rumours were likely fueled by Mercury's appearance in the last years of his life: he appeared increasingly gaunt, particularly in his last appearance on film, the These Are The Days Of Our Lives promo video, which suggested serious illness. On November 22, 1991, Mercury called Queen's manager Jim Beach over to his Kensington home, to discuss a public statement. The next day, November 23, the following announcement was made to the press: “Following the enormous conjecture in the press over the last two weeks, I wish to confirm that I have been tested HIV positive and have AIDS. I felt it correct to keep this information private to date to protect the privacy of those around me. However, the time has come now for my friends and fans around the world to know the truth and I hope that everyone will join with my doctors and all those worldwide in the fight against this terrible disease. My privacy has always been very special to me and I am famous for my lack of interviews. Please understand this policy will continue. ” A little over 24 hours after issuing the statement, Freddie Mercury died at the age of 45. The official cause of death was bronchial pneumonia resulting from AIDS. Although he had not attended religious services in years, Mercury's funeral was conducted by a Zoroastrian priest. He was cremated at Kensal Green Cemetery, and the whereabouts of his ashes are unknown, although some believe them to have been dispersed into Lake Geneva, or in his family's possession. The remaining members of Queen founded The Mercury Phoenix Trust, and organised The Freddie Mercury Tribute Concert. He left £500,000 to his chef, £500,000 to his personal assistant, £100,000 to his driver, and £500,000 to his partner, Jim Hutton. Mary Austin, his life-long friend, inherited the estate and now lives there with her family. As a child, Freddie Mercury’s parents listened to a great deal of Indian music, and one of his early influences was the Bollywood playback singer, Lata Mangeshkar. According to Record Collector magazine, after moving to England, Mercury became a huge fan of Jimi Hendrix, The Beatles and Led Zeppelin. Mercury said of Hendrix: “Jimi Hendrix is very important. He’s my idol. He sort of epitomizes, from his presentation on stage, the whole works of a rock star. There’s no way you can compare him. You either have the magic or you don’t. There’s no way you can work up to it. There’s nobody who can take his place.” Another of Mercury’s favorite performers was singer and actress Liza Minnelli. In a 1975 interview, he says of Minnelli: “Liza, in terms of sheer talent, just oozes with it. She has sheer energy and stamina, which she gets across the stage, and the way she delivers herself to the public is a good influence. There is a lot to learn from her.” The 1999 Millennium Poll, in which six hundred thousand Britons participated, he was voted into the number 14 and 15 spots as a popular musician and songwriter, respectively. Mercury ranked at No. 58 in the 2002 list of "100 Greatest Britons", sponsored by the BBC and voted for by the public. Two of Mercury's songs, "Bohemian Rhapsody" and "We Are The Champions" have each been claimed, in separate polls, as the world's favourite song. Most recently, an Ericsson poll of six hundred thousand people in sixty-six different countries found "We Are The Champions" to be the world's most popular tune. This contradicts another major poll by Guinness World, which had previously found "Bohemian Rhapsody" to be the world's most popular song of the past 50 years. The online music community at DigitalDreamDoor has consistently placed him at the number one position on a list of the 100 greatest rock vocalists. In a list of the greatest English language singers of the 20th century, compiled by BBC Radio, he was the highest-ranked hard rock vocalist, having been voted at the tenth spot. He also came in second in MTV's list of the 22 greatest singers of the past 25 years. In 2006, Time Asia magazine voted Mercury as one of the most influential Asians in the past 60 years. Freddie Mercury was of full Parsi descent, grew up in India, and moved to the UK when he was only 17. Consequently, he was arguably the world's first Indian rock star. A Royal Mail stamp called the Millennium Stamp commemorated the life of Freddie Mercury. The stamp caused controversy because Queen drummer Roger Taylor could be seen in the background. At that time, members of the British Royal family were the only living people who usually appeared on stamps in the UK, although this policy has since changed. (The tradition had been broken decades earlier, in 1967, with a stamp for Sir Francis Chichester who had sailed around the globe solo.) On August 25, 2006, an organization calling itself the Islamic Mobilization and Propogation, or UAMSHO, petitioned the Zanzibar government's culture ministry, demanding that a large-scale celebration of what would have been Freddie Mercury's sixtieth birthday be canceled. UAMSHO had several complaints about the planned celebrations, including that Mercury was not a Muslim, had a homosexual lifestyle that was not in accordance with the laws of Islam, was not a true Zanzibari, and that 'associating Mercury with Zanzibar degrades our island as a place of Islam.' The planned celebration was canceled. Rock star David Bowie, who recorded the song "Under Pressure" with Queen and performed said song (together with the remaining members of Queen and Annie Lennox) at The Freddie Mercury Tribute Concert, said of Mercury: "Of all the more theatrical rock performers, Freddie took it further than the rest". – "He took it over the edge. And of course, I always admired a man who wears tights. I only saw him in concert once, and as they say, he was definitely a man who could hold an audience in the palm of his hand. He could always turn a cliche to his advantage." Opera singer Montserrat Caballé, who collaborated with Mercury on the Barcelona album said of him, “The difference between Freddie and almost all the other rock stars was he was selling the voice.” Pop star Robbie Williams, who has performed with two of the remaining members of Queen, Brian May and Roger Taylor, was quoted as saying, “Freddie, if you’re out there and you want to choose any artist to channel your work, please give me an album, or at least a middle eight.” Comedian Mike Myers, whose movie Wayne's World introduced "Bohemian Rhapsody" to a new generation of listeners, said of Mercury, "He had theatricality, he was larger than life, new, fresh, cool. This is a god that walks as man." Rock singer Rob Halford said of Mercury, "I was deeply saddened when I heard Freddie passed away. A great performer, a great voice, a great musician was lost to the world. Thank God we have the music to listen to forever." "I watched him, and I watched him die, and it was so painful for me, because I really loved Freddie Mercury, the way that he just truly went with his voice." Dave Mustaine of Megadeth. Although singer Axl Rose (of Guns N' Roses) has long been criticised by gay activists, he was apparently a devoted Freddie Mercury fan. He has been quoted as saying, "If I didn’t have Freddie Mercury’s lyrics to hold on to as a kid, I don’t know where I would be. It taught me about all forms of music. It would open my mind. I never really had a bigger teacher in my whole life." Rose also performed “We Will Rock You” and “Bohemian Rhapsody” with Elton John at The Freddie Mercury Tribute Concert. Freddie Mercury was the one rock star mentioned in singer Kurt Cobain’s alleged suicide note (1994): "I havent [sic] felt the excitement of listening to as well as creating music along with reading and writing for too many years now. I feel guilty beyond words about these things. For example, when we’re backstage and the lights go out and the manic roar of the crowds begins, it doesn't affect me the way in which it did for Freddy [sic] Mercury who seemed to love, relish in the love and adoration from the crowd, which is something I totally admire and envy." In an interview with KROQ radio, singer Tori Amos claimed that she invoked the spirit of Freddie Mercury in order to write her 1992 song "Sugar." As she explained, "I was in Bath. This voice in my head, it sounded like Freddie, Freddie Mercury’s voice, and I was playing these chords, and I was thinking about this thing that made me write this song, and I just heard him go, 'Sugar, he brings me Sugar,' and I just went, 'Thanks, Freddie.'...." Subscribe to Freddie Mercury RSS Feed to get latest lyrics and news updates. What do you think about Freddie Mercury? Let us know in the comments below! Freddie Mercury the new Queen singer?